The perfect door for a quilter! 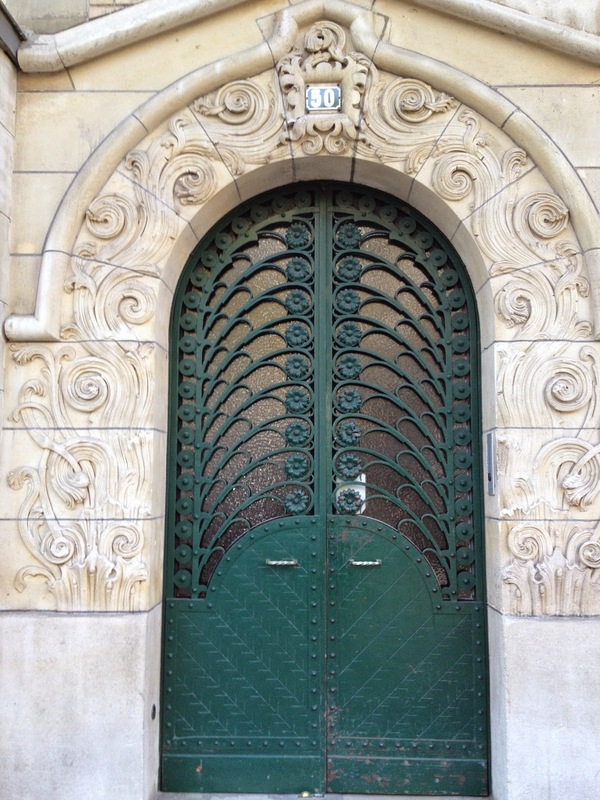 I stumbled onto this doorway yesterday. It is just a few blocks from our apartment. It is gorgeous. Love the "feathers" in the green metal work. Definitely going in my mental drawer for future quilting designs. Lots of switching around of colors on my Paris Flower blocks. I am committed to these blocks so far...I think! Still unsure about the layout...something on point I'm thinking with some sashing. Stocking progress. Love it when I get to start making Santa. 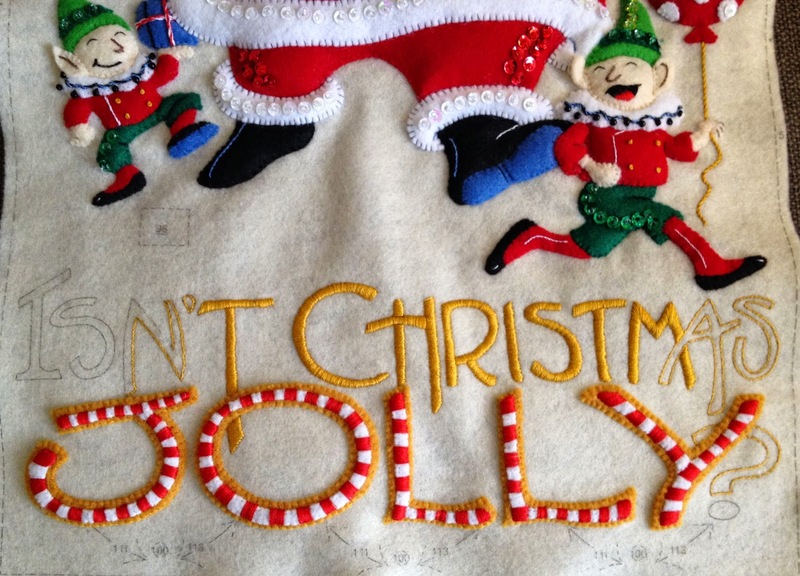 I am getting so excited about how close I am to being done with stitching the words! I like it when all the petals are the same value and the center star pops. I ripped apart the blocks from yesterday to do more fine tune. Didn't sew the purple block below together yet...too much contrast still between the petals. I am finding it is hard to battle my natural tendency to put together high contrasting fabrics. And this one is sooo dark! I am working with the Bali Pop, Plumb Pudding. There are several very dark batiks in it...so this project may wind up going to the "dark side." Time will tell. Saw sunlight today which just added that little boost to my energy level. I was such a good girl. Got my fitness walk done early in the day then did my grocery shopping. It is time for me to renew my French visa so I had to get passport photos to turn in with my application. There are photo machines everywhere in Paris for this purpose...and there was a line at the one I used today at my little metro station. I might have to blog further about this experience...or not. It is just dealing with beauracracy not matter where you live! It annoys me because just like in the US, there are an abundance of illegal immigrants here and doing things legally seems to be ridiculous. After all...I am just a glorified tourist...thanks to my wonderful husband who has the, "Working Visa." It really just seems a complete waste of time. And of course it is so complicated that my husband's employer is paying a French law firm to handle my application. I hate to think how much money it is costing. So silly. I could buy some great batik fabric with that money which is really a much better value for the money. It is time to work on my Bucilla projects. Here's what I got done yesterday. I am definitely getting the satin stitch down! Santa now has some cool bowling shoes! The sky was the same color of gray all day today. I detest gray days. My little Paris sewing room is so gloomy...even with all my lights ablaze and pretty floral blocks in the works. I did rework the top block to the shorter dark petals. The bottom block is going to get some new dark petals...that aren't so dark. The colors looked so pretty sitting together on my ironing board! A quilter's best tool is a sharp seam ripper. My day started out very fun...I bought theater tickets for our upcoming trip to London in mid-November. This may be my last chance to see shows in London so I'm going for the iconic show, "Les Miserable," and a newer musical, "Dirty, Rotten Scoundrels." We will be there for our wedding anniversary so that makes it all the easier to splurge on entertainment. I'm so glad my husband likes musicals! Progress on the Bucilla projects. 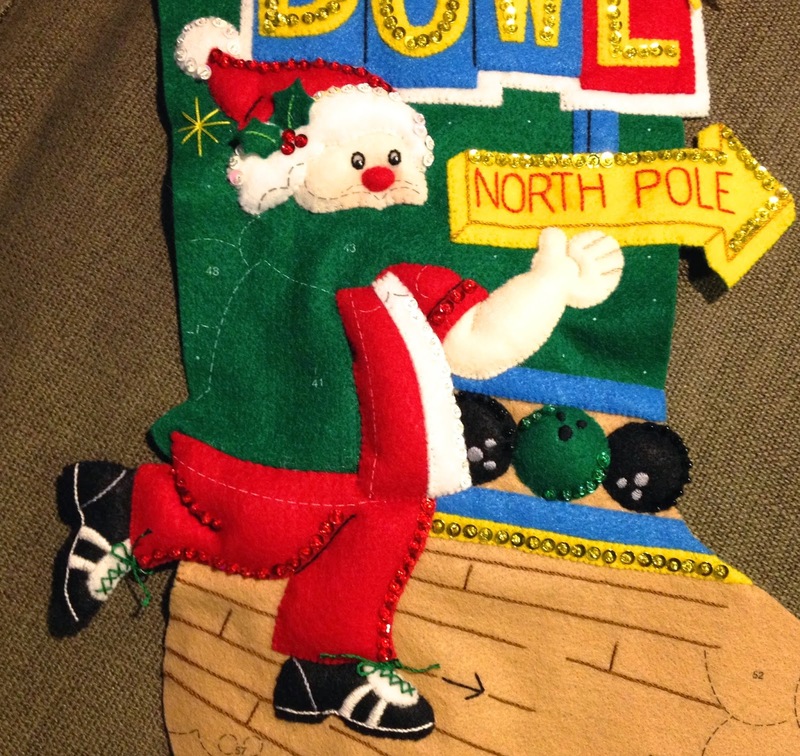 I got to start Santa's body on the bowling Santa stocking...one bowling shoe partially embroidered. I did add some real make-up blush to Santa's cheeks though it is hard to tell in the top photo. I always practice first on a scrap piece of felt. Today I woke up with the determination to make my Paris flower block a reality. I have been wanting to create a flower block using 2 1/2-inch strips for months. I've always had a pesky reason that kept me from it...no more! After creating the Patch Draw version on EQ7, I went about cutting fabric. After a few stumbles I finished the block...beautiful. But right away I realized it wasn't quite right. The darker petals are too long...breaking the imaginary circle of the flower's shape. I went for a walk and came back to tackle redrawing it on Patch Draw...practice does make working with any computer program easier so lets just say I got some more practice. Oh...yes...there are "Y" seams. Piece of cake! That is the only challenge to this design and I had no problem executing them as you can see. I love the new design...the outer imaginary circle is now in place. That will be important when I get to the stage of coming up with a quilting design. And while I was in the designing mode...came up with another variation of the block that doesn't have "Y" seams...it's pretty cute too! I haven't hit just the right layout yet but at least I can start making the blocks. I will pull out my seam ripper and fix the pink block to the new version. It is basically a nine-patch block...which is my favorite quilt block...ever...endless possibilities when working with it. I am staying on task with my Bucilla projects. Two stars made and a start on Santa. Tonight I will embroider his face. One more letter stitched on the wall hanging. 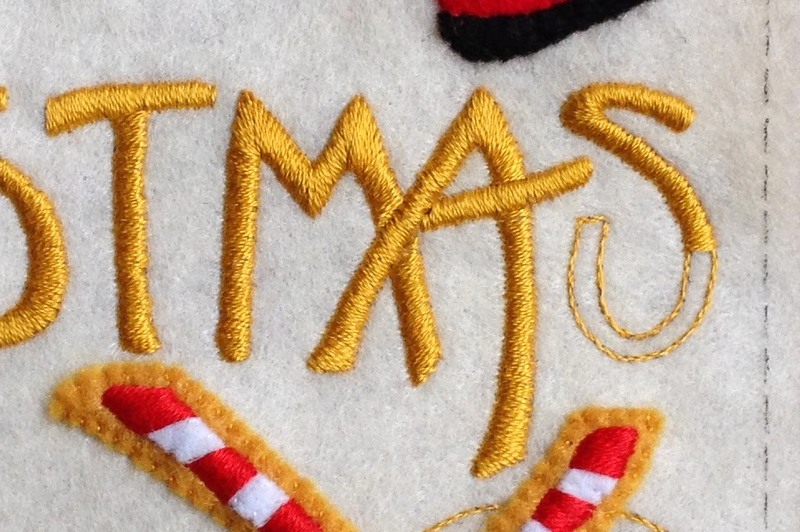 I re-did the "t" so many times...lots of knots while I was stitching. I was watching, "Forrest Gump," and got a little distracted. I practically have the entire movie memorized so I don't know why that happened. Tomorrow I need to wake up and get some administrative work done. While my in-laws were visiting we took them to Mainz, Germany one weekend. It is a nice little town outside of Frankfurt that hubby and I go to several times a year, as business often takes him to Frankfurt. We showed them our favorite things to do in Mainz, which I have talked about before, but we also did a day trip to Oppenheim, a town know for wine making. There is a gorgeous cathedral there, St. Catherine's. This church has some of the most impressive stained glass windows I have ever seen...and I have seen a lot in the past three years. One of my photos from my iPhone actually came out great! We did a tour of some underground, man-made caves all underneath the city. Unfortunately we were not able to get into an English speaking tour and the German one was tortuous...too much time spent standing in one place listing to a language we didn't understand. My husband had done the English tour before...note to all...don't go if you don't speak the language. One tunnel looked like another. We recovered quickly by having a quick bite to eat as we sipped on some local Riesling wine. It was excellent. Lots of gorgeous planters...I might replicate this one. It's a series of stacked metal containers with just enough spacing between each one for some soil and plants. 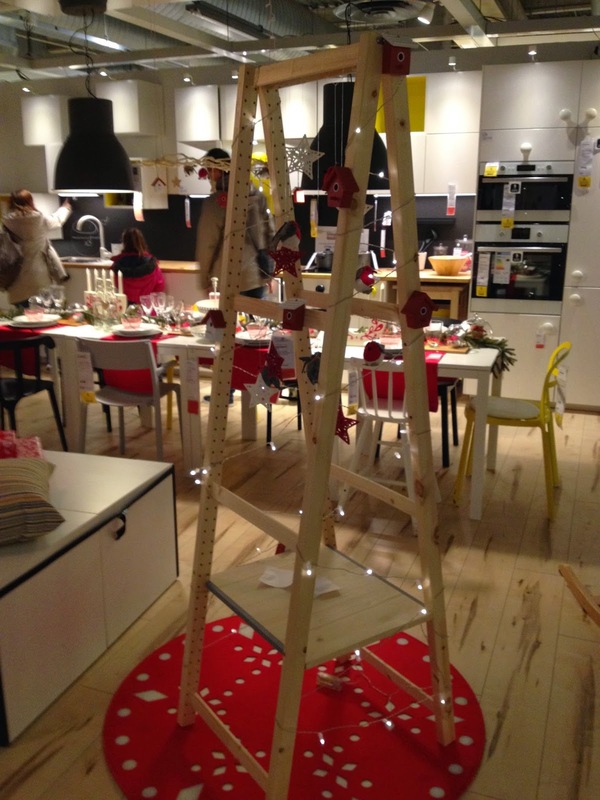 Yesterday my husband wanted to run into his office for an hour or two so I was deposited at the IKEA. As usual...I saw something I wanted right away and they were out of them. I thought this large ladder-like stand would be good for a variety of situations...quilt rack...holiday decoration holder...oh well. I will save this photo in case I want my handyman to make me one. There was a bushel of Bernese Mountain Dog plush toys on hand. I resisted and didn't buy any. Plugging away on my Bucilla projects. 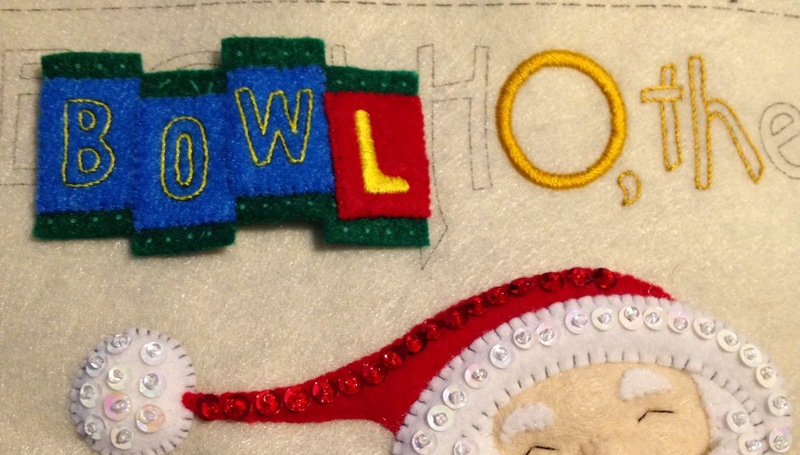 Still working on the satin stitching for a wall hanging and have also started an ornament to go with the Bowling Santa stocking. EQ7 had me a bit stumped when I was working on my Paris Flower block. I switched from the "easy draw," to the "patch draw" in the block side of the program. I learned how to use it last spring but it took a little bit of review. The advantage with the patch draw is you can duplicate shapes in the block and move them around very easily. 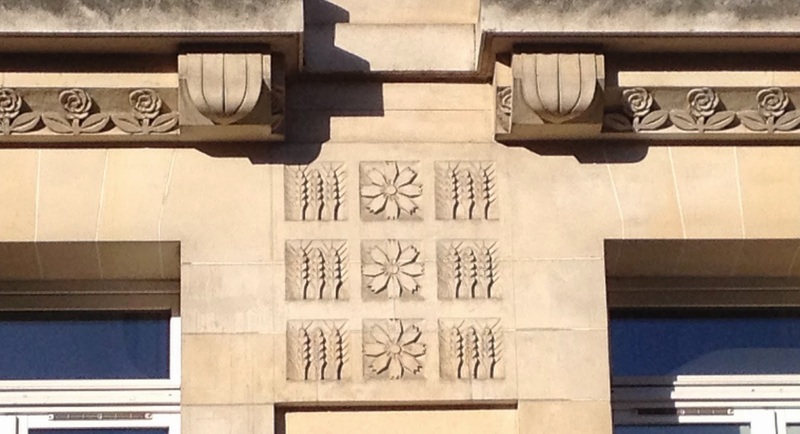 It is a good way to ensure uniform sizes when working with the same shapes at different angles. I am finally ready to make a sample block. One, 2 1/2-inch Bali pop strip won't be enough fabric to make a flower block so I have to decide if I will go totally scrappy or controlled scrappy. I meant to post yesterday but all of the sudden it is a new day! Thought I would recap some of the travel photos from the visit of my in-laws. They had been to Paris before so we only did a few small museums. My two favorite small museums are Musée de l'Orangerie and Musée Rodin. 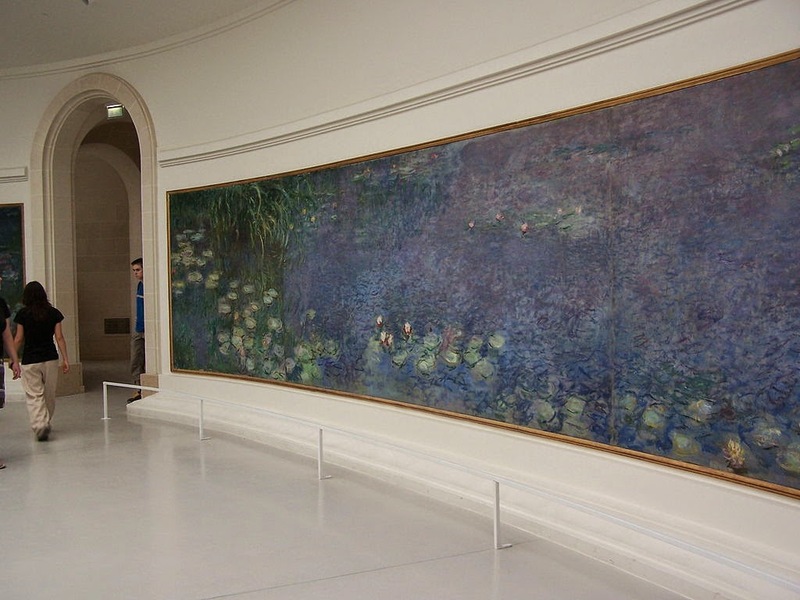 Musée de l'Orangerie's claim to fame are two huge oval rooms with gigantic paintings from Claude Monet's waterlily series. No photos allowed on the day we were there. There is also a nice selection of impressionist paintings by Renoir and a few other French painters. Plus a nice introduction to post impressionist works. If you don't have much time to spend in Paris this is the perfect museum to visit. Photo from Wikipedia's website on Musée de l'Orangerie. If you have all day to devote to impressionist paintings then start early in the day at this museum and then walk across the Seine to Musée d'Orsay for lunch and spend the rest of the day viewing all the works there. 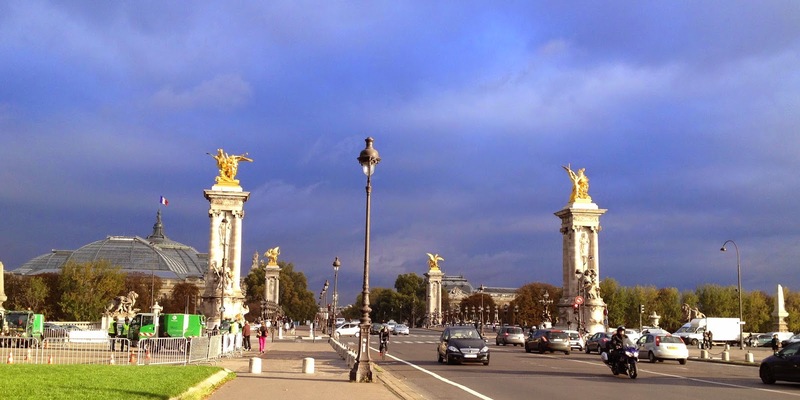 You can buy a reduced ticket at Musée de l'Orangerie to visit both places on the same day. There is a nice restaurant on the top floor of d'Orsay with a small menu that is right off the main impressionist gallery...highly recommend! The second small museum that is also a must see on my list is Musée Rodin. The Hotel Biron which houses indoor displays, was newly renovated since my last visit in January of 2013. Three Van Goghs but I could only get a photo of one...lots of people in this very small space. The weather was perfect on our visit. The gardens are very nice with many sculptures throughout on display. Eiffel Tower in the distant background. I'm getting back into my routine. I actually cooked dinner twice this week. I cannot walk far enough to burn all the calories I have consumed eating at restaurants lately! With that said...today my husband and I went out to eat for lunch at an Indian restaurant. At least we didn't get any dessert. Plugging away on my Paris Flower quilt design. The hardest part...borders! I can't just leave it to a simple band of inspiration fabric! That's my project tonight while my husband works a late shift. 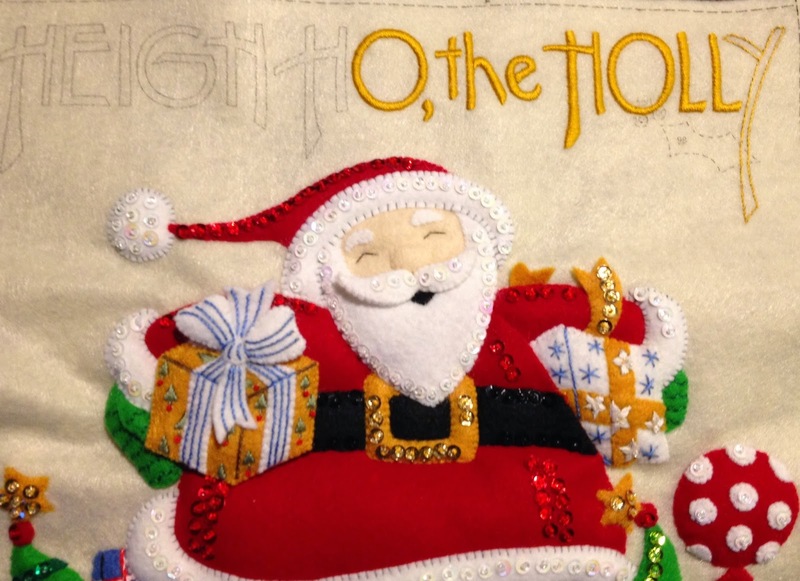 Finished adding the beard and mustache on my latest cross-stitched Santa. I wanted to note that when it comes to making the beard loops I use three strands doubled instead of one six-strand piece of floss. This gives me 6 strands going through the paper-punched holes instead of 12. If you make these kits...you know what I mean. Day three of working on the latest stocking kit. I'm getting close to finishing the satin stitched letters at the bottom of this wall hanging...which means I am close to starting all the ones at the top of the wall hanging. I have to share the latest movie I watched yesterday. I loved it!!! You must be a Shakespeare fan for this one. The movie takes the possible story that Edward de Vere, 17th Earl of Oxford, was the real writer of Shakespeare's works. 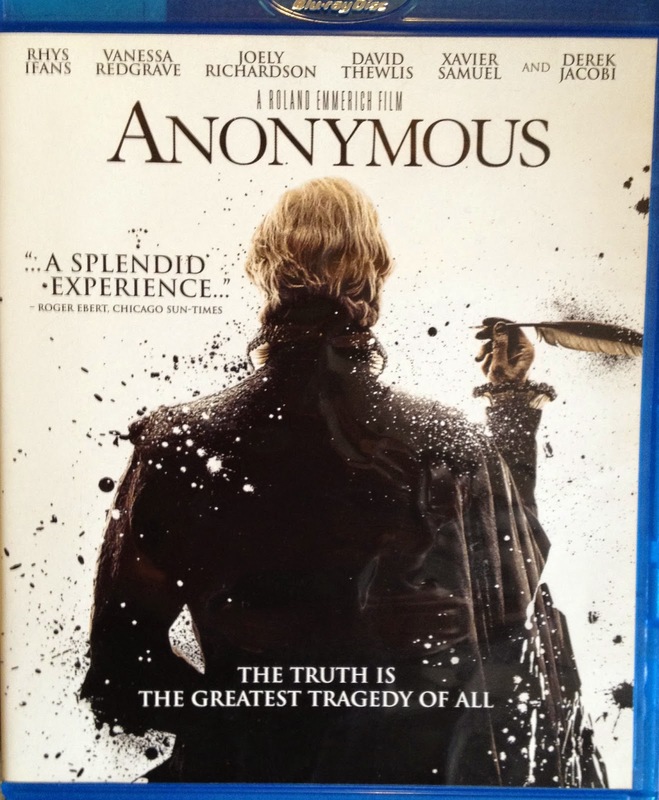 It has a great Shakespearean plot...very smart movie. Day two of my current Bucilla stocking kit. More outline stitching...this time with black floss. A little bit of satin stitching for the bowling ball holes. I worked on another letter for my wall hanging...slept on it and still hated the final result this morning! Night time lighting was the problem. There were just parts of it I didn't like. I ripped it out and started again. My second shot was much better. I will finish the rest of the "S" tonight and be on track for a letter everyday this week. It's a good thing. On Monday during my fitness walk I was deep in thought on quilting designs. I have a flower quilt I want to design using 2 1/2-inch strips. I have the fabric...but no pattern. The first five minutes of my walk I spotted this on a neighborhood building. See the flowers? That was it. It kept my mind busy during my walk to ponder just how I would accomplish this block with 2 1/2-inch strips. I was too busy with chores to sit down at EQ7 until this morning and here is what I came up with. Haven't figured out the rest of the quilt yet...maybe tomorrow. All our recent visitors are gone and no one is officially on the schedule to visit us for some time. The most important part of my usual routine is fitness walking along the Seine. My husband called me this morning to warn the rain was on the way...dark clouds in the west. I hustled out the door and did see a very threatening sky. There is a new statue along my fitness route...fun!!! I feel just like this statue...fleshy and happy. Two weeks of eating lots of great food and drinking great wine will do that for you. 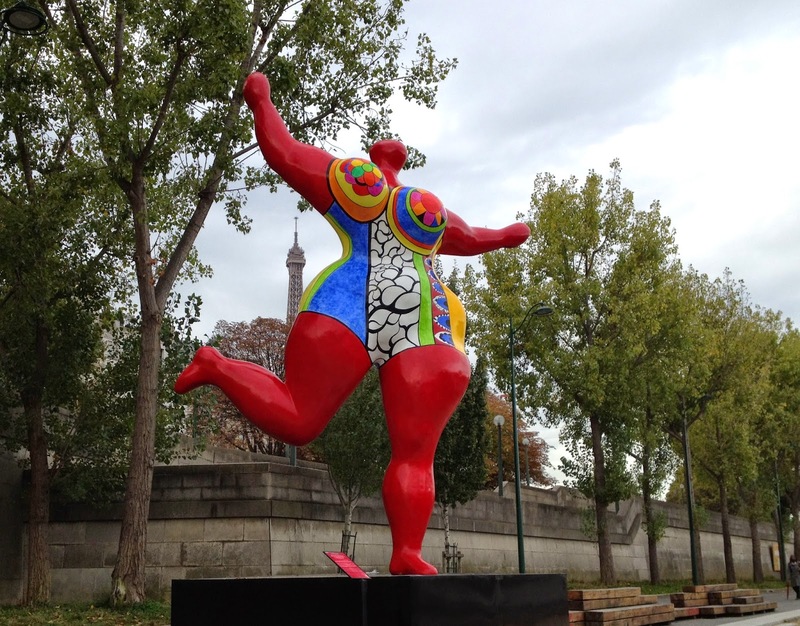 I thought I was taking a picture of the statue's name the other day but it only had the artist's name in the photo I took, Niki de Sainte Phalle. See the Eiffel Tower peaking behind her hip? But I have started my Bucilla kits again. 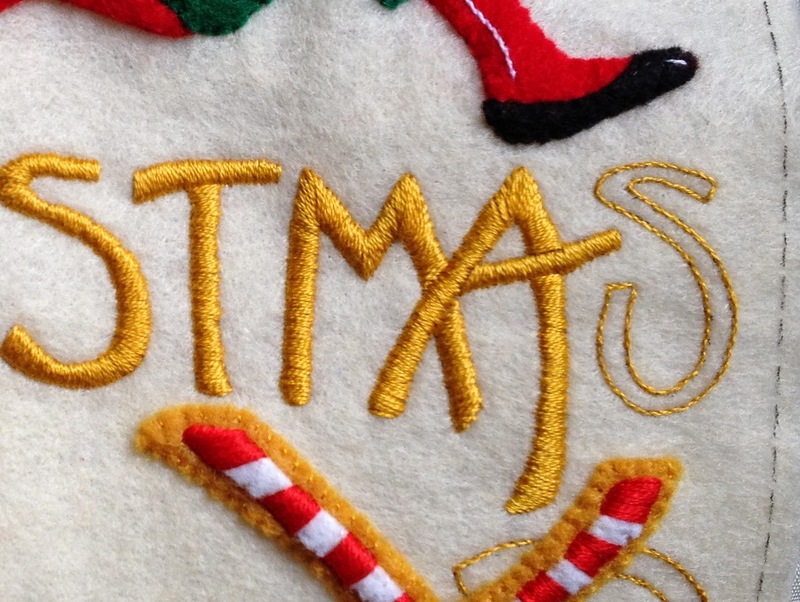 I am trying to satin stitch one letter a day...not my favorite thing. I prepped another kit. 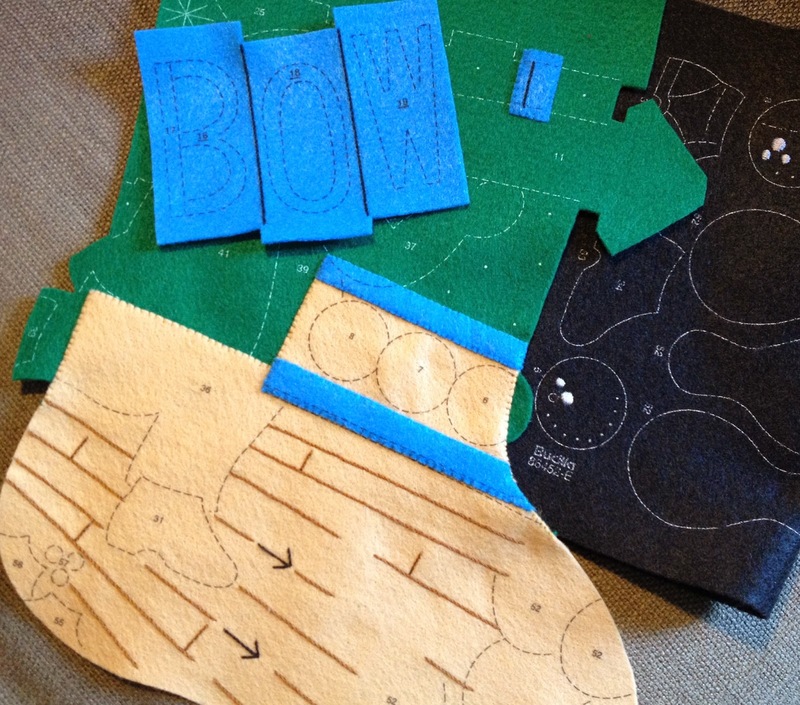 Got all the felt pieces ironed and started embroidery stitching on the stocking base. 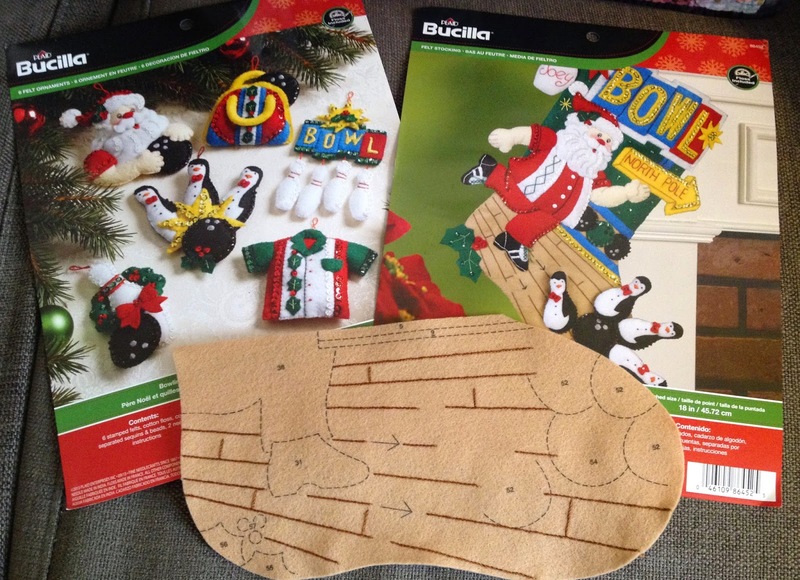 I am going with the Bowling Santa stocking and ornaments kits. More visitors have kept me out and about with little time to blog. Today we went to the quilt shop, Inès Le Boutique du Patchwork. My mother-in-law, Judy, was shopping with me today...she is a quilter too. We have been to the Houston International Quilt Show together many times. She will get to go this year without me. I've been walking her legs off around Paris to get her in shape for her upcoming marathon shopping day in Houston. She found a few things to take home with her. Here's a look at the stash she picked up...two meters of a French fabric with 7 coordinating fat quarters. A set of 18 fat quarters from Australian quilt designer, Lynette Anderson. I know you want to know the cost. The set of 18 fat quarters were $42 euros or about $54 U.S. The French fabrics were $63 euros or about $83 U.S. 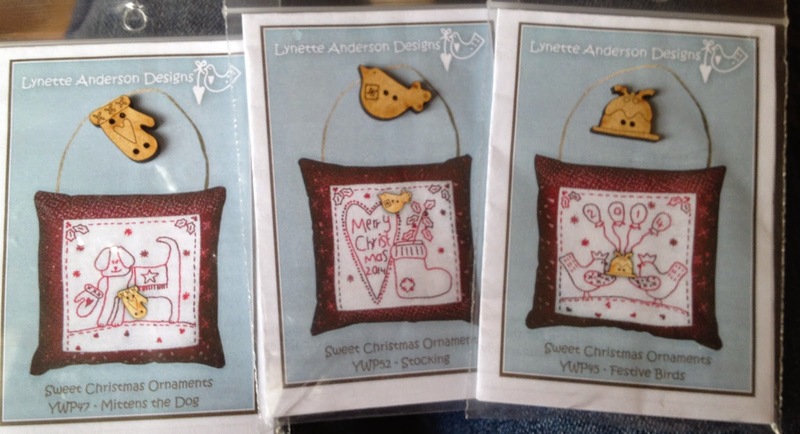 I also found some adorable ornament kits also designed by Lynette Anderson. I googled and found out there are a total of 12 designs in this series...guess I will have Judy look for the others at the Houston Quilt show. Lynette Anderson is listed as an exhibitor so should be do-able. The kits were $8.50 euros a piece or a little over $10 U.S. I sure hope they are a bit less expensive in Houston...it will be fun to compare prices. Seems to be a pattern here with my recent return to Paris...the moose have followed me. Maybe it's just the crowd that I hang out with. Our outing yesterday was the Hunting and Nature Museum. 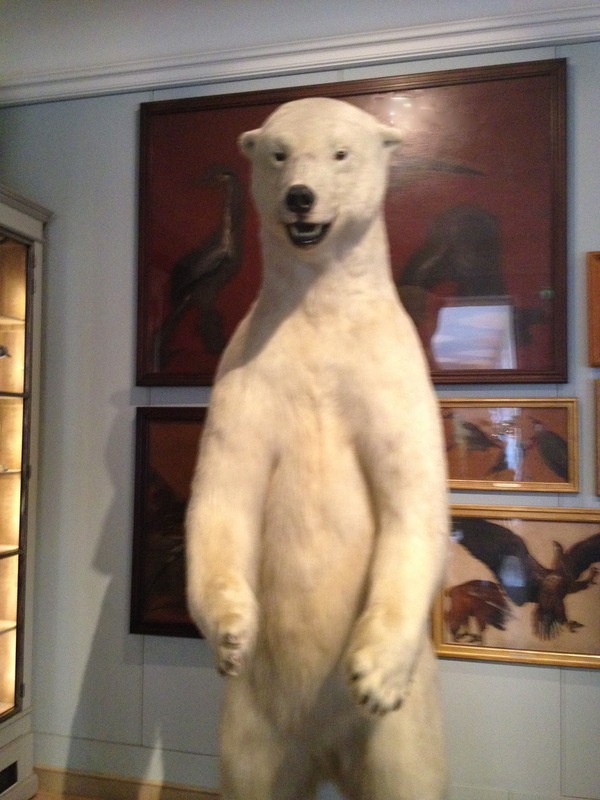 Right away I felt at home...this polar bear was the greeter for the museum. 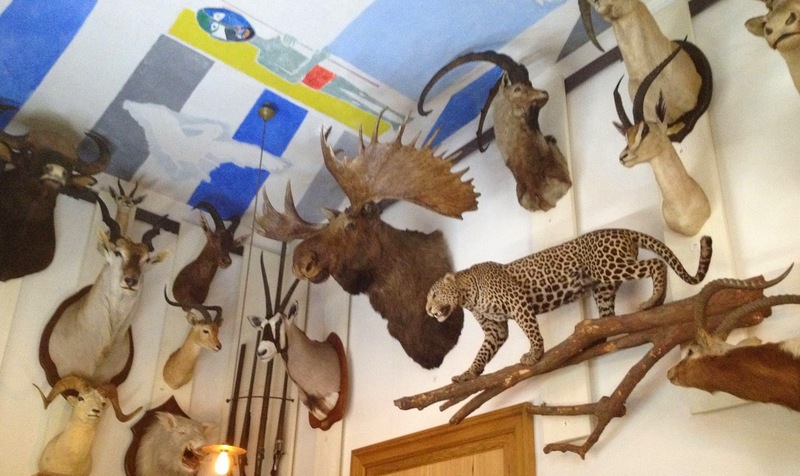 This museum is a wonderful collection of taxidermy and nature inspired art. 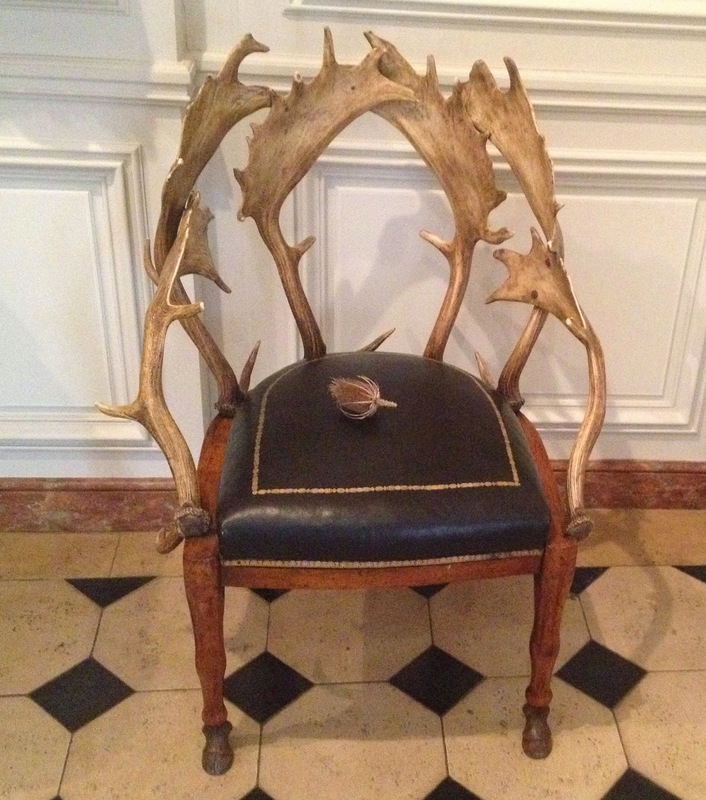 I don't normally care for antlers in my furniture but the French have a way of making it work! Notice the thistle on the seat...just a subtle reminder it's not a place for sitting in this museum. 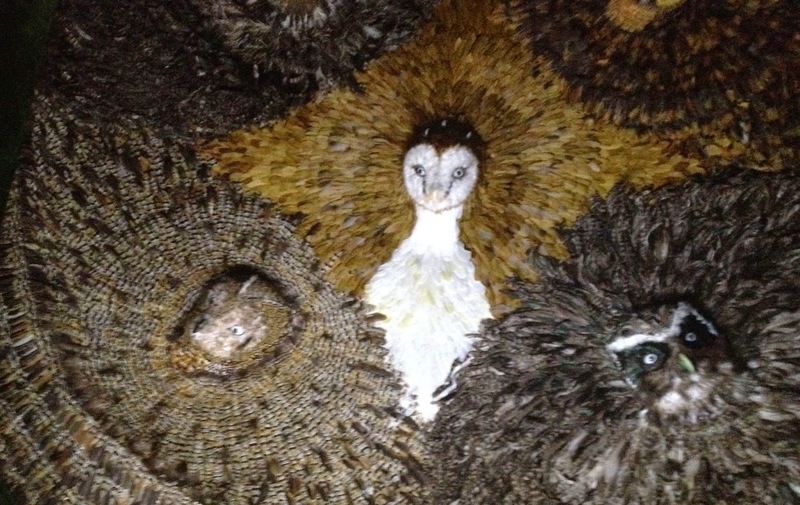 There was a closet-sized room with owls lining the ceiling...pretty spooky stuff. 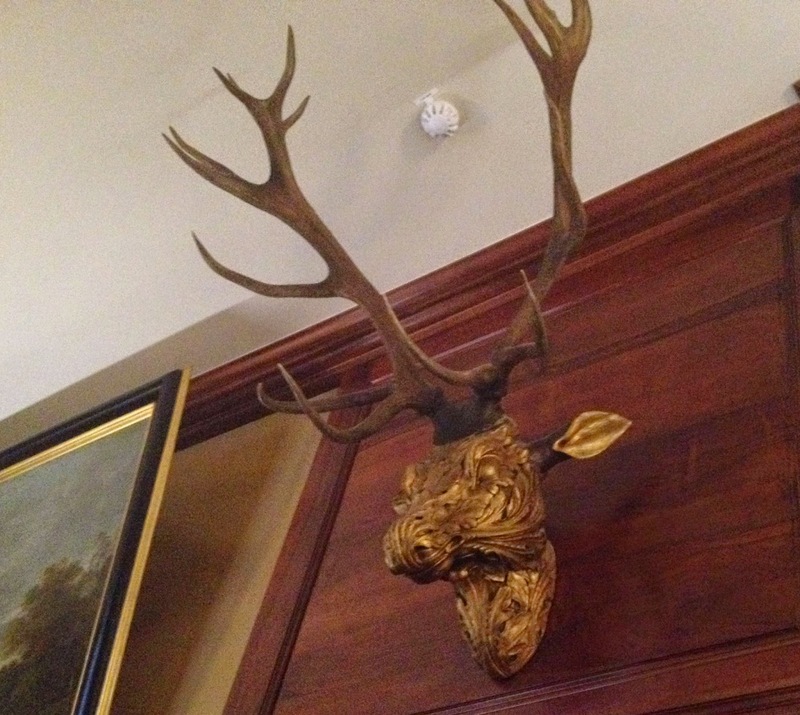 Again...the French find a way to make an antler mount beautiful...love the filigree detail on the stag head. 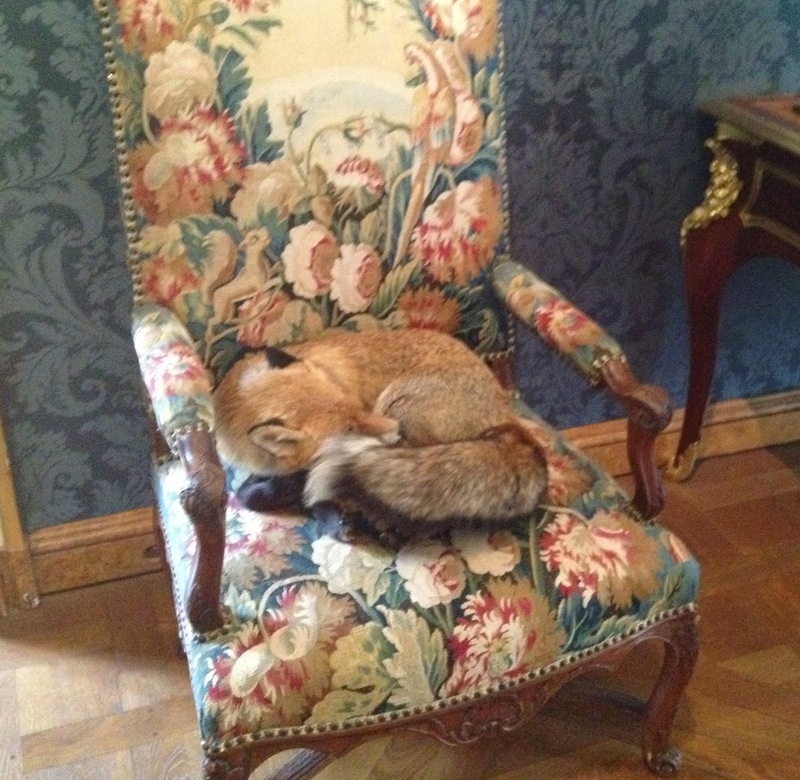 On this parrot chair was a dozing fox. I guess he didn't mind sitting on the thistle. Everyone needs a conversation piece in their decor. This was a diorama of gorillas guarding a table setting with a human digestive system model in the middle...talk among yourselves on the possible meanings the artist was conveying. What do the two seahorses at the base infer? Back to my comfort zone...brown bear with some cheetahs. I think that was rather a scrawny brown bear...obviously a distant cousin of an Alaskan Grizzly. I did mention there was a moose...with a lot of other heads to keep him company. Guess I will have to bring Hubby here someday.